Google introduced several plans for Android’s future at the recent Google I/O 2018. Android 9.0 Pie was introduced at the I/O that brought several new features t othe plate including Adapted Battery, Adapted Brightness, app actions, slice, DNS over TLS, new navigation gestures along with gesture pill or home pill, and much more. The most underrated feature, in my opinion, is the Digital Wellbeing that comes with the Google Pixel 3 and 3 XL. However there are tricks using which you can install Digital Wellbeing on almost any Android device running 9.0 Pie or later. We have already seen several manufacturers pushing official Android 9 Pie to their phones including OnePlus 6 and 6T, Nokia 7 Plus, Samsung Galaxy S9/S9+ with One UI, and Essential Phones, and many more. Moving towards our main topic here we will see Google’s Digital WellBeing app enabled on all of the above listed phones and more. Currently, only Google Pixel phones can enroll and enable the Digital Well Being functionality on their Android 9.0 Pie firmware update. However, there are still ways to enable or install it on any Android device running 9.0 Pie. This features was introduced in the latest Google I/O 2018. However, we did not hear much about it lately. The WellBeing was just a placeholder for Android According to Google’s Blog, Android’s Digital Wellbeing app will help you disconnect from your phone and re-connect to the real world. It can help in preventing phone addiction, anxiety, and ultimately achieve the balance between life and technology. Register Website: You can currently Sign up for the Android Digital Wellbeing Beta. APK download: Here, we have managed to capture the Digital Wellbeing APK for you. 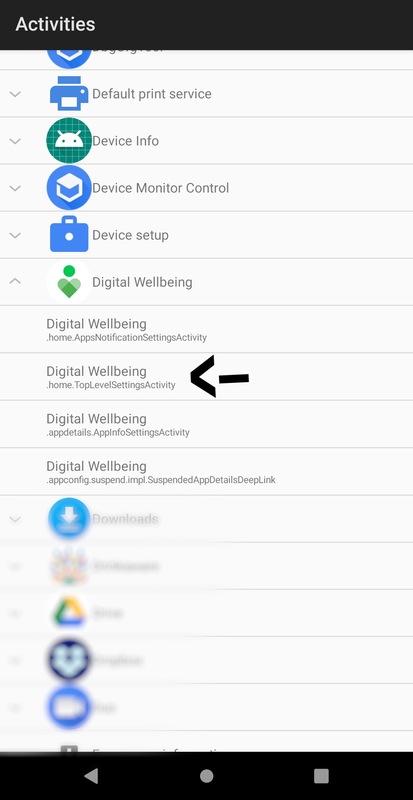 How to Install or Enable Digital Wellbeing app on any Android device? The app is targeted towards Android 9 Pie or later only. So it may or may not work on all Android devices. We already know that several Android devices from manufacturers like Google, Sony, Nokia, Oppo, Vivo, OnePlus, and Essential Phones are running Android P Beta. Note: If you have a Google Pixel, you do not need to go through this procedure. Simply download APK, install, and use. So if you want to try and install the Digital Wellbeing app, see the guide below. This tutorial makes use of Magisk. Meaning, your device must be rooted. Make sure your Android device is rooted with latest Magisk 18. Read: how to root Android P? Tap on the (+) sign at the bottom to add Magisk module. Install and reboot device once. Make sure your device is on Android P Beta or official. Download and Install the Digital Wellbeing APK from above. Download Nova Launcher or Action Launcher (or any launcher with access to “Activities”). Alternatively, you can also download the Pixel Shortcuts app from here. Hold onto the Home Screen. Search and add an Activities Widget on your desktop. Add the second from top Digital Wellbeing package. Go into settings, and search for special app access. In Do Not Disturb, and Usage Access, give Digital Wellbeing permissions. Note: Detailed tutorial and Video for placing Activities is here. Hey, the Digital Wellbeing Enabler was shared on XDA. Actually, a lot of posts you source from XDA but never link to.